I hear you: that's a laugh coming from someone who uses more than a dozen planners each year! I have learned a valuable lesson from my switching-around experiences. In most things in life, consistency is key. It's certainly true for parenting: you have to discipline your kids in the same way consistently so they can learn cause and effect. It's also true for fitness: how much more slim and fit would I be right now if I'd exercised most days for the past 3 years? And not surprisingly, consistency is key when creating a journal, diary or logbook. Ever since my post on diaries etc. I've been thinking a lot about what I want from my planner and journal. It's true I like to use my planner to plan and as a record of what I've done, in the form of a detailed logbook. But over the years I've gone back and forth over whether I want to combine my journal and planner into one book or keep them separate (and if so what format for each?). We all know I flit from planner to planner, but in the past 2 years I've also had a journal breakdown. Above you can see a photo of my large Moleskine daily planners that I've been using as journals for the past 4 years now. (You can click here to read my post about it with more details). 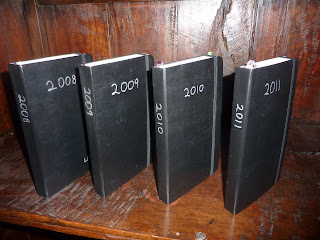 In 2008 and 2009 I was very consistent in writing in my journals, and managed to write almost every day. Now when I look back through these journals, they paint a very accurate picture of what my life was like at the time, moving from Moscow to Albania with small children. I was good about writing cute things my kids said and did. Even the stressful stuff is gratifying to read now, knowing I managed to get through it with my sanity (mostly) intact. Then in 2010 I stopped writing in my journal around March or so, because I was so stressed out all the time and I didn't want to fill my journal with constant bitching. But the result was that by not writing anything I missed out on capturing my kids' cute sayings, and the fun things we did. That makes me sad. A few months ago I thought maybe I should switch to a non-dated blank notebook for my journal. I wrote in it for a few days, tried to catch up on past events, then put it down because it was turning into a non-chronological mess. I haven't written in this year's daily Moleskine at all, because two weeks into this year we discovered that we were leaving Scotland, and I couldn't bear to write anything. Again, this makes me sad because I missed out on capturing all the wonderful things we were able to do while we were there. This morning I decided to compare my journals and make a final decision on what to use, then use it. After looking through both the dated daily and undated blank journals, I've decided to get back into the large dated day per page Moleskine as my journal. While thumbing through the pages, I enjoy seeing each day on its own page. The progress through the day per page book mirrors my own progress through the year. Each book, like each year, has a beginning and an end. Another thing I love about the day per page is that I can go back and fill in empty days. This is my new project: I will refer to my planners and back-fill empty days, so that I can re-create the consistency of having written most days. I remember this and last year well enough (with the help of my planners) to write what we did each day. There are some specifics that are lost, but I'll be able to fill in most things. That way when I read through my journals (now, and years from now), I won't have months missing at a time. I've already ordered the 2012 Moleskine large day per page planner, which I plan to use as my journal next year. We'll see how long I can maintain the consistency! I love how these look all lined up. That will look so awesome on a bookshelf! I'm glad you found some place to put down the "days of your lives", as it were, as it is such a profound joy to be able to look back on what happened, and what your kids did/said! I have enjoyed looking back through my Filofax, and reading my Gratitude Lists and what was going on at the time. I'm not sure you intended for the last few posts to end up as a series, but this and the log book and the planner necessity posts have been some of my favorites! Thank you. Thanks Rori! I'm glad you like these posts! It did turn into a kind of a series, unintentionally. I've been doing a lot of thinking lately about what I want from my planners/ journals, and what I want the end result to be. It's helping me feel more settled in my planner/ journal choices! Very interesting, Laurie. I do like the large Daily Moleskines. I'll probably buy one of the 18 monthers "just in case". I also liked reading about logbooks in one of your earlier posts. I think my planner serves as a planner and a logbook as I do keep notes on what has happened during a day, not only what I had planned/appointments, to do's, etc. Great post Laurie. I think I have FINALLY settled into a consistent routine with one planner. I've been using the large Moleskine Daily planner since February. I gave up new planners for Lent and it's been working out well. I use the Moleskine daily as a planner and a logbook. I kind of think of it as a paper version of Twitter. I write little "tweets" all day about what I'm doing, thinking, etc. I also keep some vertical index cards in the back pocket and use them for lists. I stick these in the page of the day. Sticky notes also work well if I need to jot a few things that aren't really important for the logbook. I also have a daily journal that I use for my musings, problems, ideas, etc. I'm currently using a Rhodia Webbie, but I'm sure I will change to something else as soon as I fill it. I haven't found the perfect journal just yet. I also keep a separate book/reading journal and a prayer/gratitude journal. Keep up the great posts. So nice to know there is a kindred spirit out there. Kelly I like how you use an index card for lists between the daily pages, which creates a kind of day on two pages. Someone just emailed me today looking for that format, I'll suggest to her your system! I can't live without my vertical index cards! Laurie, I think you just solved my A5 vs. Personal dilemna!! I was trying to use my planner as a journal as well and found that the personal size was too small to fit everything in (I like WO2P because I have to see my whole week). I love your idea of using the daily Moleskine! And I love reading your blog! Thanks for sharing. Thanks Grace, I'm glad you like my blog! Yes I struggle so much with the personal WO2P, the day spaces are just so small. A separate journal would definitely help. I like your blog! I can't wait to see what you do next: A5 or Personal size? Or, if you'll defect and go for an 8.5 x 5.5 inch binder. That would be a very nice size. I did laugh when I saw your photo as it reminded me of my own. LOL DK they do look very similar! I like your tabbed monthly planners hack. 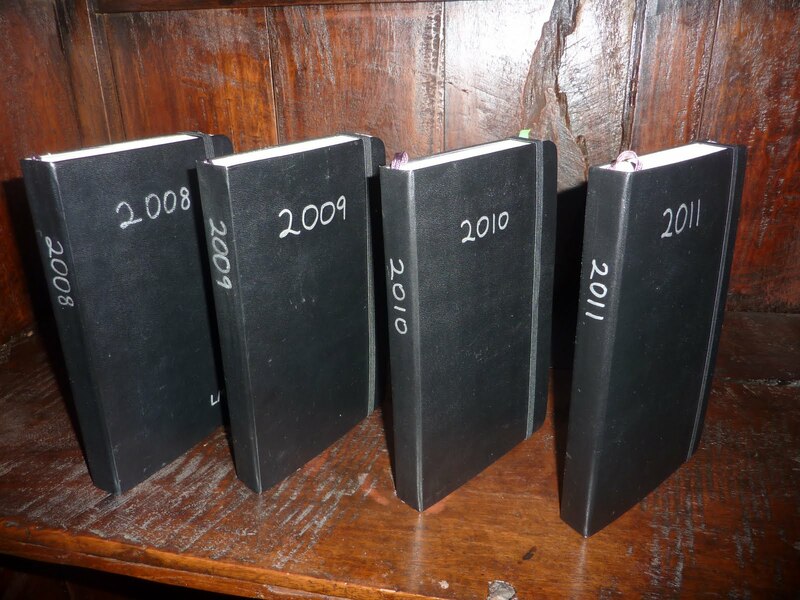 And wow, your 2011 planner is very fat already! What do you put into it? I was inspired by your blog on journals that I started keeping a journal/logbook, something to look back on my life and not have to write it all into my agenda. My question to you is: Do you find that it gets repetitive/tedious having to reenter things that happened that day? Since I carry my filofax with me, I jot down things to enter into my journal; but now i'm starting to get tired of re-entering things and starting to think about just carrying the journal instead of a filofax. Especially, after seeing Dora's system. If you want to use your other book as a journal, you don't necessarily have to detail everything that happened that day, just write about what stood out for you, how you felt, etc. What I'm currently doing, which is working really well for me, is to use my Filofax week + notes pages to plan and write in future scheduled events. Then each morning I write my day's schedule and to-dos for that day in my daily Moleskine planner. As the day goes on I jot in my Moleskine other things I did, record details of phone calls or bills paid, write cute things my kids said, whatever. That way the only things I re-write are scheduled appointments for that day. Otherwise there's no overlap: Filofax for future planning, Moleskine for recording today. Another option is to use a large day per page planner, or daily pages in your Filofax, as a combined planner + logbook + journal. I've toyed with this idea before but the result is a little jumbled. You could use the monthly pages (either in your Filo or Moleskine, whichever you choose) for the forward-planning, and the daily pages for planning each day and recording. I hope these explanations make sense!